Today I am very exited to bring you DAY 8 of my Birthday Month Giveaways by raffling off a giveaway by All Y’All Need, which is a Columbus Day Reader’s Informative Theater. This enchanting 24 page packet contains b &w as well as color scripts and character cards (King Ferdinand, Queen Isabella, Christopher Columbus as well as boy and girl) and a graphic organizer activity (I know, I want to know, I learned). 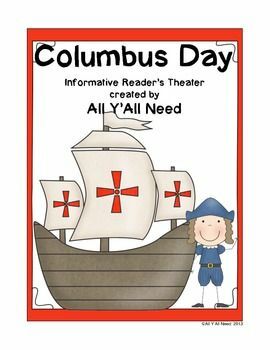 It’s perfect for teaching children facts about Columbus day in a fun, informative and interactive way. You can find this product in All Y’All Need TPT store by clicking HERE or you can enter my one day giveaway for a chance to win.